It’s an obsession! Despite resisting the urge to keep buying new puppets for the library. I found myself in need of a sheep puppet for next term at school, and yesterday I went back to find their last one. 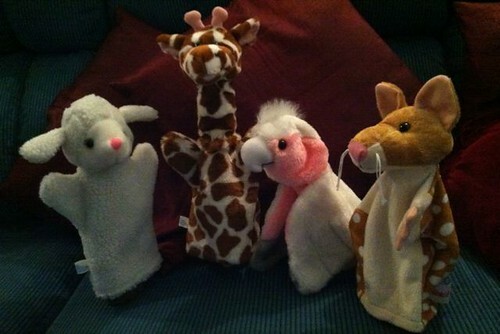 The bargain shop also had giraffes. The galah (it squawks!) and spotted quoll puppets were more expensive, from the local ABC Shop. The bargain shop had two no-necked giraffes left, so I have just combined two into one, to give my giraffe an appropriately long neck. 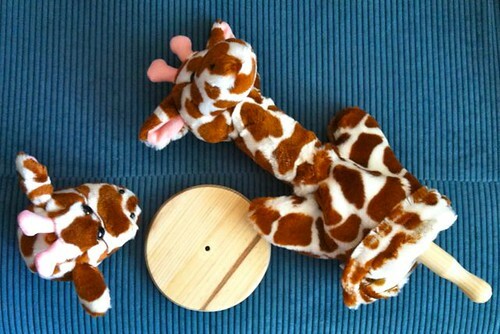 A bargain-priced wooden paper-towel holder was disassembled and the stick glued inside the giraffe’s head. The original body “glove” was glued and wrapped around the wooden stick, then the beheaded body was sewn to the base of the resulting long neck. (Above left) Customised puppet-to-be: I hope to create a bat puppet from the spare giraffe’s head on a $3 spotty Dalmation dog puppet’s body. Yet to be dyed brown or grey. I’ll need some felt for the wings, and some sharp white teeth. 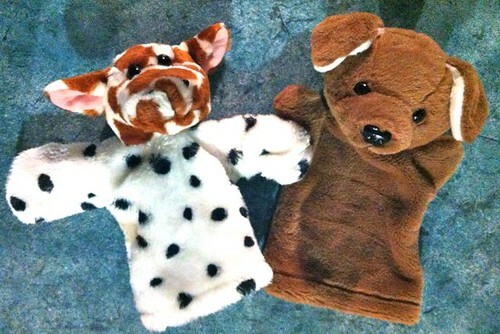 (Above right) Another dog puppet from the $6 range.